1. Heat the oil and butter in a large, heavy-based sauté pan and brown the bacon until golden. Make sure you don’t burn the fat. Remove the lardons with a slotted spoon and set aside. 2. 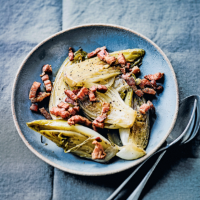 Sauté the chicory cut-side down in the fat – you want it tinged with gold, so you may need to do this in 2 batches. Add the stock, thyme and the cooked bacon. Bring to the boil then immediately turn the heat down low, cover and simmer gently for about 10 minutes. Remove the lid and continue to cook until the chicory is tender through to the middle (another 5 minutes or so). The stock should now have been absorbed by the vegetables and reduced, leaving just a light coating on the chicory. 3. Taste before seasoning – the stock will have reduced and you have bacon in the pan, so you shouldn’t need to add salt, but perhaps some pepper.